Trout Unlimited mid-Atlantic policy director David Kinney moderates the discussion between sportsmen and PFBC staff. This is just a quick blurb about the sportsman’s forum held on Wednesday night. Many good things were discussed and I will put up a recording of the proceedings later. I’m fishing today so in the meantime I will leave you with this, more to come. Let’s keep up the pressure and good work. – D.E. 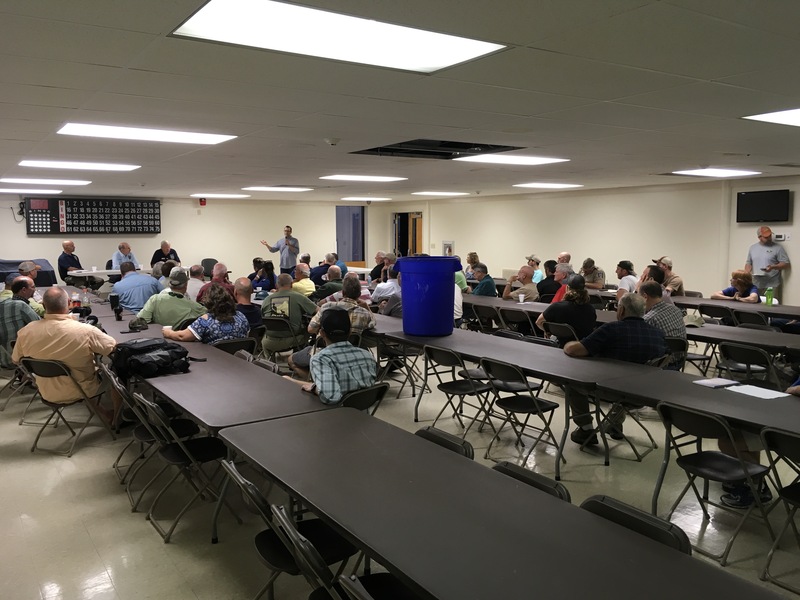 Last night the PFBC finally addressed the “pink elephant” phantom that still hangs over the shadow of what was a very informative Wild Trout Summit held in Bellefonte August 14th. The wild trout coalition in Pennsylvania had made it clear that they were disappointed by the proceedings of the summit. Many present in Bellefonte a few weeks ago wanted to, but never had, the chance to address what they feel is the greatest threat to wild trout: stocked trout. Last night, they finally got their chance. The discussion was passionate and intelligent. The panel consisted of Executive Director John Arway, Commissioner Richard Lewis, and Commissioner Robert Small. Once again they explained the position of the PFBC both financially and politically. However, this time with more detail into the intricacies of the political struggle to keep PFBC’s financial boat afloat. Specifically, how Senate Bill 30 (a proposal to increase license fees) is being used by politicians in Harrisburg as political leverage against the Pennsylvania Game Commission. This is critical to understanding the balancing act that is wild trout policy in PA. The PFBC needs to spend its political capital wisely and that is exactly what they are in position to do going forward. Last night Executive Director John Arway made it clear that PFBC supports a scientific approach to protecting wild trout while also addressing the commission’s financial and political needs. If SB30 does not pass you can expect to see two hatcheries close. That is the proposed plan of action as the PFBC moves forward. You can also expect the to see a beginning to the end of stocking on class A wild trout stream as a result of these hatcheries closing. This decision and plan of action allows the PFBC to begin to transition to a more sustainable wild trout management approach while also maintaining a politically defendable position to those that support stocking. It is important to realize that this is not necessarily a win for wild trout supporters. The PFBC still has large financial gaps to fill. A weak PFBC is still a threat to the wild trout coalition. The panel pointed out last night that fewer legislators participate in hunting and fishing as compared to generations before. This fundamental disconnect from nature and wilderness could drive ignorance and indifference in Harrisburg to the concerns of sportsmen. While passing SB30 might mean two hatcheries remain in operation for now that is a small price to pay for a strong PFBC in the future.